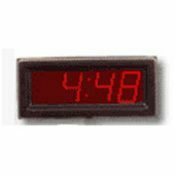 Franklin Super LED Digital Wall Clocks create the most readable office clocks available. 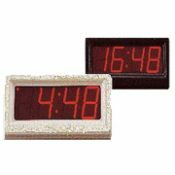 Their color fits any office décor and they easily hang on wall or clock outlet. Both models can serve as either a 12 or 24 hour time piece. Just flip the switch to determine format. Quartz Time Base – Battery reserve will update the time for a period of 24 hours. Upon restoration of power the clock will display current real time. Time base requires one 9 volt battery, which is not supplied.